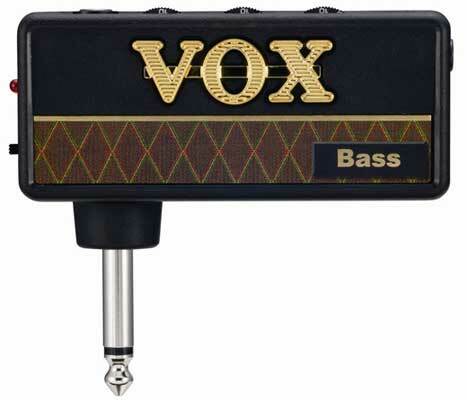 Vox AmPlug Bass Guitar Headphone Amp; Finally a headphone amp worthy of the low tones of a bass guitar! The amPlug series received wide-ranging acclaim from guitarists around the world for delivering incredible guitar tone in a pocket-sized unit. The amPlug Bass is modeled after VOX's classic AC100 bass amplifier, and expands its potential with a full-range tone that supports today's bass sounds. A compressor/boost effect provides not just compression but also a thick overdrive sound, giving you the perfect tones for performing in any style. Careful attention has been paid to the sound quality, and a high-quality FET buffer circuit has been used to obtain even greater dynamic range. Vox AmPlug Bass Features a great-sounding headphone guitar amp that gives you serious sound fast Plugs directly into your bass AUX in jack lets you jam along with your CD/MP3 player 100% analog circuit faithfully simulates the response of the original amps Bass features a full-range bass sound with a compressor/boost effect Up to 15 hours of battery life with two Alkaline AAA batteries Quick and easy setup! Enjoy serious guitar sound, fast. Jamming late at night? Don't want to wake the neighbors? Maybe you want to work out a lick with your MP3 player without taking the time to set up your amp. You want to play guitar right now. amPlug is the answer. Simply plug this palm-sized headphone guitar amp directly into your guitar, and enjoy serious guitar sound anywhere, anytime. AmPlug can be used in numerous ways With up to fifteen hours of battery life, it's easy to take amPlug anywhere. In addition to practicing at home, it's a great way to warm up before a live performance or on the road. And amPlug is not just a convenient way to get great guitar sound. There's also an AUX input jack so you can jam along with your CD/MP3 player. Vox amPlug is the fastest ticket to great tone anytime anywhere!